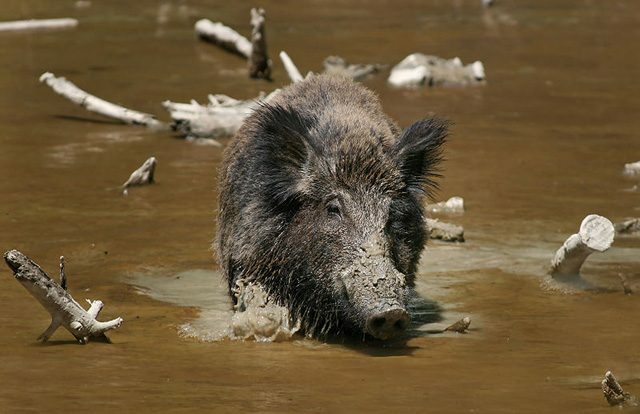 State wildlife officials say there’s a new invasive species in Michigan – Wild hogs. They are hunted on game ranches all over the state, but they can sometimes escape and officials say they can permanently alter any landscape they make their home. Peter Payette visited a man who raises pigs for his hunting ranch. Wild is not the first word that comes to mind when you see Harvey Haney’s pigs. Haney: Which one would you like me to pet? 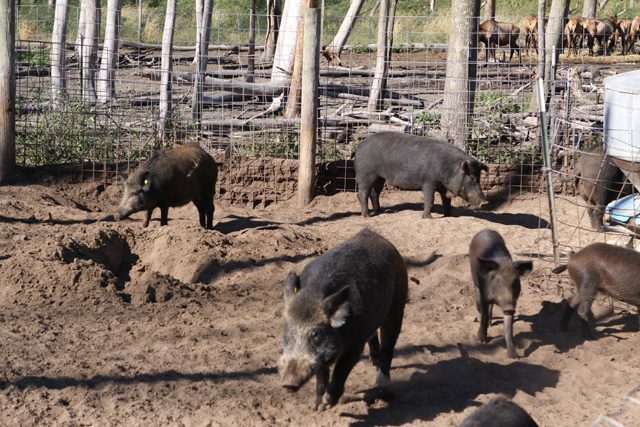 Hunting ranches refer to these animals as Russian boars. They’re brown and hairy and the males have small tusks. We’re actually not at a hunting ranch right now. Haney raises boars at his home north of Bay City for his hunting ranch an hour north. This winter he’ll release them into 200 acres of woods surrounded by a ten-foot fence. He says once on the loose in the woods the pigs will become more wild and aggressive. You can shoot one for $550. That’s about the cheapest hunt available from Heritage Trophy Hunts. Deer and elk cost $1,000. Haney expects to turn away pig hunters this winter. Russian boars are not native to North America. 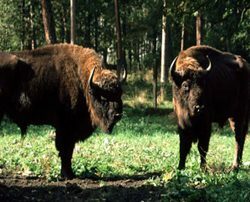 They were brought from Europe and are common in the southern United States, but state wildlife officials say there are now a few thousand on the loose in Michigan, mainly because they’ve been escaping from hunting ranches. A report from the Department of Natural Resources and Environment says nearly 50 were shot last year. 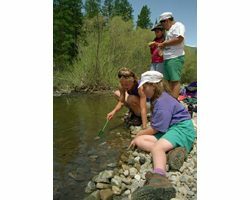 Russ Mason heads the wildlife division at the Department of Natural Resources and Environment. His staff recommends declaring wild pigs an invasive species. They tear up forests and farmland and destroy habitat for other animals. Once established, pigs are all but impossible to get rid of because they’re smart and multiply quickly. Mason says it’s possible to keep pigs fenced in, but you need something more than the standard 10-foot high game fence most ranches use. “Maybe double fencing. Ten foot high fence goes two feet into the ground, bevels in six feet to prevent digging, maybe anchored in concrete and a hotwire on top that will make bacon if you try to cross it. Plus clearing vegetation for twenty yards on either side so nothing can knock it down. That’s an expensive fence. At least 40 hunting ranches in Michigan sell boar hunts, and they have some support in Lansing. Michigan Farm Bureau came out in favor of allowing the existing ranches to operate as long there are some rules. At the moment there are no regulations for wild pigs. Earlier this month singer and gun rights advocate Ted Nugent was more outspoken about hogs. Nugent owns a ranch near Jackson. He told the Natural Resources Commission hunting is an important part of the state’s heritage and economy. He says boars seldom escape and when it happens they’re quickly rounded up. The director of the DNRE could declare wild pigs an invasive species at anytime. Then it would be illegal to have one anywhere even on a private ranch. Michigan lawmakers wouldn’t have to approve that decision, but for now the department will meet with the industry to discuss other solutions. 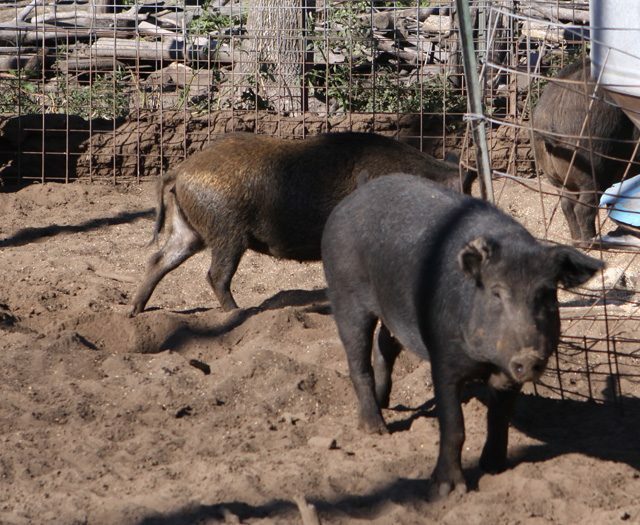 State officials say there are compromises, like requiring hunted pigs to be sterilized, but if wild pigs are regulated the next question is who pays for inspections and enforcement. There is a precedent in this region – the state of Wisconsin has declared feral pigs an exotic species. There, it’s open season on the pigs year round. Peter Payette, The Environment Report. A new report finds an agreement among the world’s governments to protect nature is failing. Lester Graham reports on the assessment which finds more animals, forests and other habitats are being lost. World governments signed the 2002 Convention of Biological Diversity, agreeing to protect more habitat and species that are at risk. An assessment of the progress has been published in the journal Science and it finds biodiversity is at greater risk than it was when the agreement was signed eight years ago. Matt Foster is with the environmental group Conservation International. 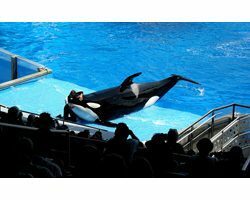 He says despite some government efforts to protect habitat, there have been more pressures destroying habitat and biodiversity. Foster says much more needs to be done by governments and the private sector to preserve natural areas and protect species. Remember that huge blackout in the summer of 2003? Forty-five million people in the Midwest and Northeast US – as well as 10 million in Canada lost power. 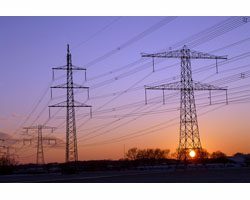 Julie Grant reports that the federal government and utilities are spending billions of dollars on what’s called a “Smart Grid” – in part, so we don’t have more large scale blackouts. Right now, electric power in the U.S. is generated by a relatively small number of very big power plants. That power is transmitted all over the place. But this set up is increasingly running into problems. The demand for power is skyrocketing: from big American houses and TVs, air conditioners and computers. The grid is struggling to keep up. And it’s not always succeeding. There have been more – and more massive – blackouts in recent years than in previous decades. Universities, private laboratories, and utility companies are all looking at different aspects of making the electric grid smarter. Chris Eck is spokesman for First Energy, which provides power in Ohio, Pennsylvania and New Jersey. He says there are so many ideas on how to improve the nation’s electrical system. The Department of Energy says the smart grid will change the electric industry’s entire business model. Instead of being a centralized, producer-controlled network – it will transform to become decentralized and consumer-interactive. Ken Laparo works on these kinds of issues at Case Western Reserve University in Ohio. He says a smart grid will get consumers more involved in planning their energy use. Laparo says most of us just look at those little bars on our electric bills that show how much energy we used that month. But he says it doesn’t really mean much to us. But companies are developing all kinds of products: smart plugs, smart thermostats, smart appliances, that tell you how much energy is being used – so customers can decide the best ways to reduce energy use – and to reduce their bills. Utility companies might start charging more at peak energy times of day – and they will communicate those shifting prices to “smart” consumer devices in real time. But there’s still a lot to be done. A decentralized system is going to need better communication. If every programmed refrigerator is constantly trying to optimize its energy usage based on the power’s moment-to-moment price — the electricity system will also have to be an information system. Each smart appliance and home meter, will have to be able to communicate with the energy companies. If it works, this type of communication could help utility companies predict an overload on the power system – like the one that started the black out in 2003. Utilities today just predict when usage will be high. But a smart grid, they will actually know how high it is in real time. Utilities will also have a better ability to fix problems in the system before they get out of control. This is what some researchers call the Holy Grail of the Smart Grid. In the short term, they see consumers learning more about saving energy, and communicating that to the power companies. But in the long term, they want to be able to sense and manage the grid, to avoid those debilitating blackouts. The 2003 blackout started because there was a high demand for power in one Ohio town. When that one generating plant went off line – it tried to get power from another plant, and overloaded the next plant, setting off a cascade of outages. More than 100 power plants shutdown that day. First Energy spokesman Chris Eck says a smart grid could help prevent blackouts. President Barack Obama is pushing for a new federal program that would create a Cash-for-Clunkers like rebate for people who make energy-saving home repairs. Orlando Montoya covered the President’s announcement. The program would be called HomeStar. 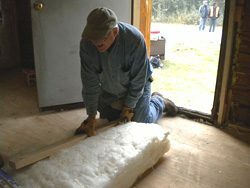 In it, homeowners would be eligible for up to $3,000 in rebates if they hire someone to seal up their attic, install new windows or make other repairs to cut down on home energy use. The President made his announcement at a community college in Savannah, Georgia. In the audience were contractors that he said could do some of the energy-efficient work. Administration officials say, the program could cost six-billion-dollars. 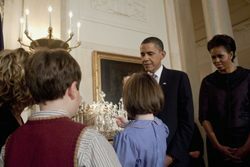 Mr. Obama wants the HomeStar program included in a bill jobs bill being drafted by Congress. For The Environment Report, I’m Orlando Montoya. of coal mines and timber plots. I’m standing in a vacant lot in downtown Birmingham, Alabama. I see overgrown weeds and closed businesses, but James Smith sees something entirely different. He’s President of an international company called Green Building Focus. When he looks at this lot, he sees an uptapped market. He wants to build an eco-industrial park here. 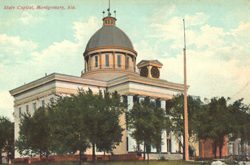 Alabama, a green hub of the south? This is the land of mega-churches and Republicans, not environmentalists. That’s Gil Rogers. He’s an attorney with the Southern Environmental Law Center. He says nationally Republicans get a bad rap for denying climate change and trying to roll back the endangered species list. But at the state and local level, things are often different in the south. Rogers says these leaders often have strong ties their own piece of nature – maybe a stretch of land or a river. But Charlie Houser loves Magnolia River. He fires up his pontoon boat to give me a tour. Houser grew up here in Magnolia Springs, Alabama. When he moved back to retire, he worried about what he saw. He blames agricultural runoff full of chemicals. So, Mayor Houser and the mostly republican town council passed really tough land use rules. All new buildings have to set back 75 feet from the river. New subdivisions have to keep their run-off on site. And it’s working. The brown pelicans are back and the river is less cloudy. The state has named Magnolia River an Alabama Outstanding Waterway. Gil Rogers, with the Southern Environmental Law Center, says there are still big environmental threats in the south. Coal mining, timber, and other industries. But he’s optimistic. Certainly, it’s creating some interesting alliances – like environmentalists teaming up with hunters. Rogers says, at least in the south, he’s seeing more cooperation than ever. Beer is mostly water, but brewing beer takes even more water. The brewing industry is working to find ways to use less water. Chuck Quirmbach reports that for some companies it’s just a matter of becoming more environmentally friendly. For other companies, future water restrictions are forcing them to think about water efficiency. Step into a sports bar and ask a table of guys drinking beer what they think about using less water to brew beer… and you’ll probably get a lot of confused looks. But the brewing industry says it’s not laughing about trying to conserve water. The industry standard is that it takes about four barrells of water to make one barrel of beer, and that’s if you don’t factor in things like the water used to grow hops and other crops used in the brewing process. 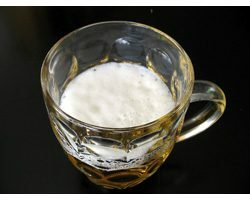 Beermaking giant Miller-Coors says it’s trying to get its water-to-beer ratio down to three-point-five to one within six years. So at miller brewing’s birthplace in milwaukee. ..the firm has a research lab working on water efficiency. Troy Rieswek manages the testing lab. Rhyswek is showing how Miller-Coors is testing ways to clean stainless steel brew vats with less water. He says if they can find a solution, it will help the company’s bottom line. Miller-Coors is also trying to use less water as it rinses plastic bottles before they’re filled with beer. smaller brewing companies and even brewpubs say they’re also trying to conserve water. Brewers recently held a conference on water conservation. The event also attracted the professionally curious, like Thomas Pape. Pape is with the alliance for water efficiency. That’s a non-profit group that promotes efficient and sustainable use of water. Pape says the brewers seem serious about conservation, because water costs are rising. At the conference, a Wisconsin state regulator told the beermakers they need to plan for new requirements for water conservation. Todd Ambs says in the Great Lakes states, where a lot of beer is brewed, a recently passed water agreement puts in tough language. If the government holds to that tough line, beer makers that want to grow may have no choice but to conserve water. and that would be fine with sports bar customer Jeff King who says he does care about conservation. King says he’d even pay more for beer if a brewing company is good at conserving water as long as it’s still a quality brew. and generating their own power. at the Rocky Mountain Institute. Lester: When I talk to some of my friends about energy consumption, they immediately jump to installing backyard wind turbines or solar panels; just getting off the grid. And I always ask, well, have you added insulation your attic? It seems like some of us are really into those gee-whiz aspects of renewable but we tend to overlook conservation, that’s something you’ve stressed. Why? Lovins: Well, efficiency, which I use instead of conservation cause it unambiguously, means doing more with less is faster, cheaper, easier, than any kind of supply. Look, if you can’t keep your bathtub full of hot water because it keeps running down the drain the first thing you do is get a plug before you go looking for a bigger water heater. Then when you get a water heater, it will be a lot smaller and cheaper and work better. So efficiency first is a wonderful adage, most people live in houses with a square yard of holes in them. Of course if you live in a sieve, it’s hard to stay warm. So, first, you start with stuff like weather stripping and caulk, and if you can you get a house doctor to come do a house call with diagnostic equipment and diagnose you houses chills and fevers. But uh, even in our house which is one of the most efficient in the world, uh, we still need to the blower door test and caulking every few years because with changes in humidity the wood works in and out and you have to renew this stuff occasionally. But the benefits are huge. Lester: How far can we really go in saving energy at home? Lovins: If you’re really conscientious about it, most people can save around half to two-thirds of their energy. That’s partly by draft proofing, insulation, and perhaps, although they’re often costlier, uh window improvements. I’m sitting under some windows now that insulate like fourteen sheets of glass but look like two and cost less than three. Then also it means whenever you get lights or appliances, you get the most efficient you can, so after some years you’ve turned over the stock and if you’re ever going to buy an appliance, go to aceee.org. The American Council for an Energy Efficient Economy posts their list of the most energy efficient appliances. Of course, a minimum, you should get energy star, that at least knocks the worst stuff off the market. But within the energy star category, there is quite a lot of variation and it is worth shopping for the best ones. Lester: What about the upfront costs of new appliances, new windows, new furnaces, things like that? Lovins: For many kinds of appliances, there isn’t even any correlation between efficiency and price, but if there is, it’s probably still a very good deal; a much better return than you can get in any other form of investment and with much less risk. Think of it as money very well spent and of course, if you had first done the very cheap stuff like stopping up that square yard of holes in your house, the wind doesn’t whistle through, it saves so much upfront that it helps pay for everything else. The whole package is really quite an enticing return. 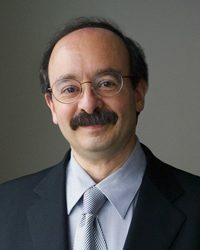 Lester: Amory Lovins consults on energy issues and he’s the chairman of the Rocky Mountain Institute. Thank you for your time. too much waste during the holidays. Jewish people light candles each of the eight nights of Hanukkah – a tradition dates back 2200 hundred years – when the Jews reclaimed the Holy Temple in Jerusalem from the Greeks. Rabbi Arthur Waskow says they needed oil to light the temple. A few years ago, Rabbi Waskow realized this is an environmental message for people today. So Waskow wants people to see Hanukkah as a time to conserve natural resources in their own lives – and in public policy. to rest more, so we emit less carbon. A related blog post from Yahoo!